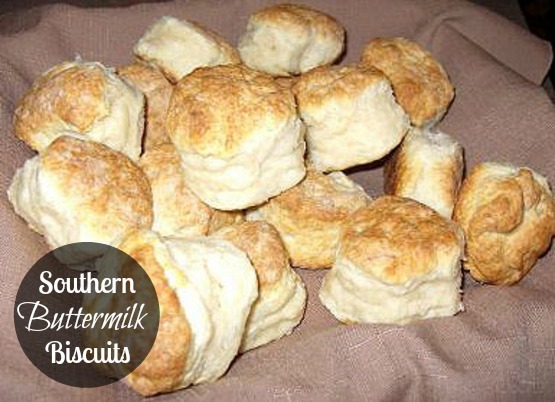 Southern Buttermilk Biscuits is one bread that my husband’s grandmother was best at making. She made them from scratch, with love. While biscuit making was once considered a necessary skill for charming folks at church socials, welcoming neighbors and snatching up a husband, the craft of making biscuits isn’t heard of too often anymore. This is a strong tradition in my husband’s family and I will continue to pass this tradition along. Preheat oven to 450°F. Combine the dry ingredients in a bowl, or in the bowl of a food processor. If using a food processor, just pulse a few times until the consistency is achieved. Add buttermilk and mix JUST until combined. If it appears on the dry side, add a bit more buttermilk. It should be very wet. Gently, gently PAT (do not roll with a rolling pin) the dough out until it’s about 1/2″ thick. Fold the dough about 5 times, and gently press the dough down to a 1-inch thick. Use a round cutter to cut into rounds. Make sure to dip your cutter into the flour so it doesn’t stick to the dough. You can gently knead the scraps together and make a few more, but they will not be anywhere as good as the first ones. Place the biscuits on a cookie sheet. If you like soft sides, put them touching each other. If you like crusty sides, place them about 1-inch apart. These will not rise as high as the biscuits place close together. Bake for about 10-12. The biscuits will be a beautiful light brown on top and bottom. Do not over bake. Note: The key to real biscuits is not in the ingredients, but in the handling of the dough. The dough must be handled as little as possible or you will have tough biscuits. I have found that a food processor produces superior biscuits, because the ingredients stay colder and there is less chance of over mixing. You also must pat the dough out with your hands, lightly. Rolling with a rolling pin is a guaranteed way to overstimulate the gluten, resulting in a tough biscuit. Also, you can make these biscuits, cut them without baking, and put them on a cookie sheet for freezing. They will keep for up to a month. When you want fresh biscuits, simply place them frozen on a cookie sheet and bake at 450°F for about 20 minutes. I live in Belgium & we don’t know with what do you eat them? With butter & cheese? We eat buttermilk biscuits with butter, jelly or even southern white gravy smothered over them.